Fish tacos were a bizarre and astonishing menu item when I first moved to Austin back in the mid 90’s. I certainly never saw them on the menu in the midwest, and frankly, they took a long time for me to warm up to. SMIL loves this restaurant Z’Tejas. Like ridiculously beyond over-enthusaistically loves this restaurant. We didn’t eat out much growing up, so when I started dating my husband our freshman year in college, it was a new and exciting experience that his parents lived in town, and ate out frequently, plus well they also had that house on the lake. Sigh. Anyhow, it became a joke between Cory and I that almost whenever we ate with his parents, which was often, they picked Z’Tejas. At the time, I had not yet cultivated my love for spicy foods and and was just branching out from my previously mostly bland diet. I’m not sure if Z’Tejas has an item on the menu not containing chilies, chipotle, or other such southwestern exotics. Heck, even the cornbread has jalapenos. So I would cringe (mostly silently) and everyone would suggest choices with the exuberism of one who’d just won the multi-lottery at his most desperate moment. Anyhow, I’ve been thinking of making fish tacos often recently. ( I previously integrated them into my diet circa 2001.) Friday night at a party, someone who works with my sister mentioned Z’Tejas and their fish tacos, and I knew it was fate. I just *had* to make fish tacos, and I can’t make fish tacos without thinking of SMIL. Now, mine are a bit different than Z’Tejas, but here’s what I see as integral to a fish taco: 1) White fish 2) Cabbage 3) Spice and 4) a tortilla. I used to drizzle a habanero sauce on mine on top of dry cabbage. Over time, I’ve realized I like my spice *in* my fish and my cabbage to exhibit a saucy-sour component to balance. Most places seem to serve cream sauces as the side, but in general, I’m just a vinaigrette gal. So here’s mine. Don’t get carried away with your ground red pepper, it sneaks up on you and can make your fish crazy hot. Feel free to change up your fish, just choose a mild white fish and you’re good to go. Heat a skillet (I use an oval non-stick fish pan I picked up somewhere along the way) over medium high heat. Rinse and dry fillets with a paper towel. Sprinkle first with sea salt, then red pepper, black pepper, paprika, followed by garlic salt on each side. You want to cover the surface, but very gently as this is a mild and delicate fish. Pour about a tablespoon of the grapeseed oil in the skillet, then use a wooden spatula to spread over the entire surface. Place fillets in skillet and cook until edges turn opaque and center is opaque 1/3 of the way through. Flip using a wide spatula, then cook on opposite side until opaque throughout. Depending on thickness, total cook time will be around 5-7 minutes. Chop cabbage and onion into a large bowl. In a saucepan, bring ingredients to a boil. Cook for 1 minute, then remove from heat. Pour vinaigrette over vegetables, then chill in the fridge. This will make a large amount. You can easily half it or serve it with other meals. It will keep 1 week to 10 days in the fridge. 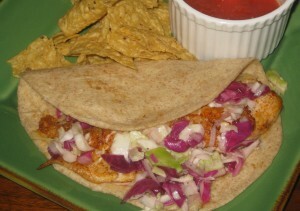 Serve fish in a warmed whole wheat tortilla and top with coleslaw. Enjoy! Thanks for keep trying new things! Thanks so much for the real fish taco recipe! What a great find!